1447 Decembrio writes "Vita ..."
Trotti's comment signals, that now Trionfi is (at least in Ferrara) a well known game. Probably the appearance must be interpreted in the way, that experiments are done with the number of trumps. Possibly the begin of the end of the 5x14-structure, possibly related to the new allowance in Florence 1463. Found by Thierry Depaulis: a description of a sermon in Padova. The note of a "Cardinal"-card is surprizing. But one of the surviving Trionfi decks contains a cardinal on the ace of coins. 23 Trionfi cards were offered in 1939 to an American collector, who "declined to purchase them because he believed to be a much more recent rendition of 15th century tarocchi cards." Only a picture of the cards is known today (socalled "Rosenthal Tarocchi", Kaplan Encyclopedia of Tarot I, p. 99). 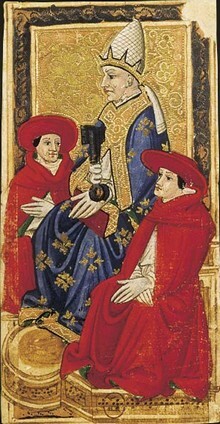 Another possibility it is, that the preacher adressed only the Pope card, which in early examples (for instance Cary-Yale and Charles VI Tarocchi) often showed a pope together with two cardinals. On the other side the term "cardinal" had been occasionally used in the game of Karnöffel for the highest trump, the "Karnöffel". A short biography of the preacher Roberto Caracciolo da Lecce is given by "The Reading and Preaching of the Scriptures in the Worship of the Christian Church: The Medieval Church" by Hughes Oliphant Old, 1998. Caracciolo belonged to the highest respected preachers of the time, although he is far less known than San Bernardino, St. Capistranus and Savonarola, who all also preached against playing cards and gambling. His scripture against playing cards in 1455 had been synchron to similar activities of St. Capristanus, who preached in the years 1453-1456 in Germany and burnt playing cards. The political aim in this time (1455/56) was a crusade against the Osmans, which had conquered Constantinople in 1453. St. Capistran was successful to collect an army of 15.000 - 20.000 peasants, the Hungarian leader John Hunyadi organized further 25.000 - 30.000 fighters. The army was successful in 1456 to free the city of Belgrade against an attack and siege of a greater Osmanic army (siege of Belgrade). The Osmanic storm in this region was finished till 1521 with this victory. Both Capistran and Hunyadi died in a bubonic plague following the battle. The plague in its extensions also reached Italy and caused many deaths. Trionfi.com has its focus on Tarot History and especially the origin of Tarot in 15th century, also the representation of about 100 000 Tarot and other playing cards in the Tarot Museum. The chapter "Trionfi as Cards (Documents)" presents the early documents, which note the term "Trionfi" (or similar, for instance "ludus triumphorum") in context to playing cards. The first appearance is from February 1442. The chapter is still in development. Author: when not otherwise specified, autorbis. Copyright: trionfi.com. Links do lead occasionally to foreign sources, we've no influence on these sites and are not responsible for their representations and opinions.